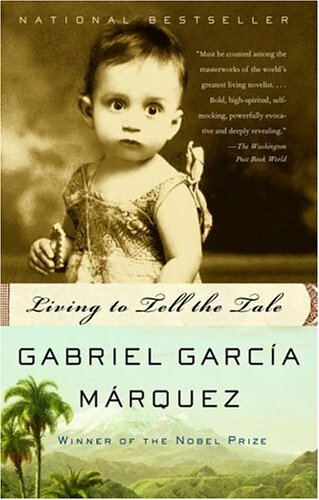 I am a big fan of Gabriel Garcia Marquez so I looked forward to reading his autobiography - Living to Tell the Tale. I thought the tale of someone who wrote 100 Years of Solitude must be absolutely, jaw-droppingly fascinating. To put it bluntly - it wasn't. What a disappointment. I got stuck on the book for more than two weeks (one look at my blog will tell you that this is REALLY long in my case) because I kept getting bored after a few pages. Since the volume is more than four hundred pages long, that meant a lot of reading breaks, and progressively less appetite to pick the book up again. It's not that Living to Tell the Tale is a bad book. It's typical Marquez when it comes to writing style - flowery, colourful, touched here and there with supernatural. If this was my first encounter with the Nobel-winning author, I would probably be delighted. Unfortunately, compared to his other writings, this is weak stuff. Living to Tell the Tale is oppressively more 'realistic' than 'magical'. In the book's defence, it is an autobiography and you don't get too imaginative when writing non-fiction (at least I believe you shouldn't). Fair enough. But even if we forget magical realism and it's charms, Living to Tell the Tale still leaves much to be desired. I admire autobiographies which tell me something about an author's inner life, about his motivations, feelings, events that shaped him. I like to have the subject brought to life. Here, I feel as if I've just read Marquez's CV. The narrative is full of names which probably mean nothing to the reader, unless you're really interested in history of Colombian media development. We get to know newspaper editors, journalists, aspiring writers and poets, politicians etc. I do understand why this crowd was important in Marquez's professional progress, but why would it interest me? Childhood stories are better, family yarns are quite delicious but overall - not the best book I've ever read. Completely unremarkable.